Naomis picture appeared in the Spring 2000 issue of the UHS (University High School in Pacific Heights, San Francisco) Journal when she and several of her alumni friends returned for a visit during the winter break. Naomi appeared in two pictures on the College-Age Holiday Reunion page: in the right column, second and third from the top (enlargements below). Naomi with fellow alumnae Stephanie Chin, Candace Chin (not related, who attended Barnard in N.Y.C., as did Marimba, below) and Tonyanna Borkovi. She roomed with Tonyanna in Toyon Hall at Stanford during her sophomore year. Toyon is where Naomis fathers cousins, Kathy and Karl Nakamura, lived when they attended Stanford; they now live in Palo Alto only a few minutes away from campus (conveniently nearby so that they kept Naomi well supplied with goodies during her stay at Stanford). Naomi with Marimba Gold-Watts (a talented ballerina who attended Barnard in New York City) and Chris Drake, who also attended Stanford and is at grad school at Harvard studying law (while Im also at Harvard at the Graduate School of Design, 2004). 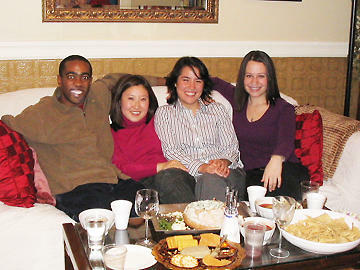 A reunion of UHS graduates Chris, Charlene, me and Melissa at Moms 2004 cookie party.